Our Pediatric Nurse Practitioner Acute Care (PNP-AC) track within the Doctor of Nursing Practice (DNP) degree program prepares you to focus on caring for children with acute, critical, and chronic illnesses and/or injuries. PNP-ACs provide health care to children (infancy through young adulthood) and their families in inpatient, emergency, and specialty care settings. PNP-AC practice focuses on restorative and/or palliative care for children. 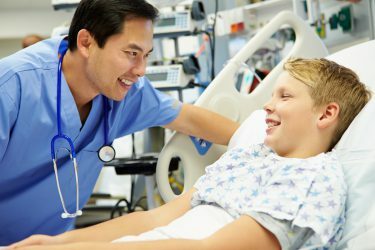 Acute Care Pediatric Nurse Practitioners are critical to the care of children of all ages, as there is currently a national shortage in pediatric care providers. As an Acute Care Pediatric Nurse Practitioner, you will specialize in caring for patients who have high intensity nursing and medical needs. You will partner with patients, families, and health professional colleagues to promote self and shared management, including the treatment and prevention of disease. The UW School of Nursing is the only nursing school in the WWAMI region (Washington, Wyoming, Alaska, Montana, Idaho) to offer the Pediatric Nurse Practitioner Acute Care track. Students interested in focusing their practice on child health promotion and disease prevention should consider applying to the Pediatric Nurse Practitioner Primary Care track. Students interested in health care systems and education across the health spectrum (wellness through acute care) should consider applying to the Pediatric Clinical Nurse Specialist track. Successful PNP-AC graduates are eligible to sit for the Acute Care Pediatric Nurse Practitioner examination through Pediatric Nursing Certification Board (PNCB).